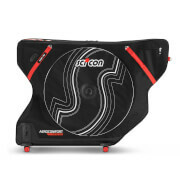 Developed and tested by professional cycling teams such as Cannondale-Garmin and Tinkoff-Saxo, Scicon’s AeroComfort 2.0 TSA™ bag is the number one bike bag in the world and is ideal for transporting any racing bike frame. Blending the flexibility and lightness of a soft bike bag with the stability and safety of a hard case, the Scicon AeroComfort 2.0 TSA™ Bicycle Travel Case features a lightweight design that provides a high level of protection in the vital areas. Minimal disassembly required, your bike can simply be mounted to the integrated on the Antishock Bike Frame and the only parts that need to be removed are the quick-release skewers of your wheels. A durable Nylon outer-shell resists abrasion while the thick layer of high-density foam padding offers outstanding protection. The internal strap system holds the bike firmly in place for extra stability and safety and a metal rear derailleur protector safeguards your rear shifter. Inside Stabiliser System (ISS) offers an innovative adjustable strapping combination and a saddle cover hold the bike steady during transport. 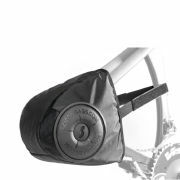 External lateral shield cups offer a reinforcement to avoid abrasions to the bag and protect the wheel's hubs. A reinforced bottom allows for a foundation with an anti tear material that preserves the bikes vulnerable parts . Double padded inner pockets with zippers for wheels measuring up to 700c. Dimensions: 118cm x 25cm x 90cm. Bi directional shoulder strap can be removed before flying. Extra strong smooth rolling 40mm thermo rubber wheels with replaceable bearings. Ultra-wide low profile chassis for stability. Please Note: This product is not suitable for bikes with disc brakes. 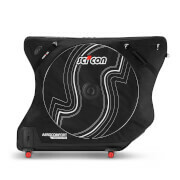 The Scicon aerocomfort 3.0 range is suitable for bikes with disc brakes.